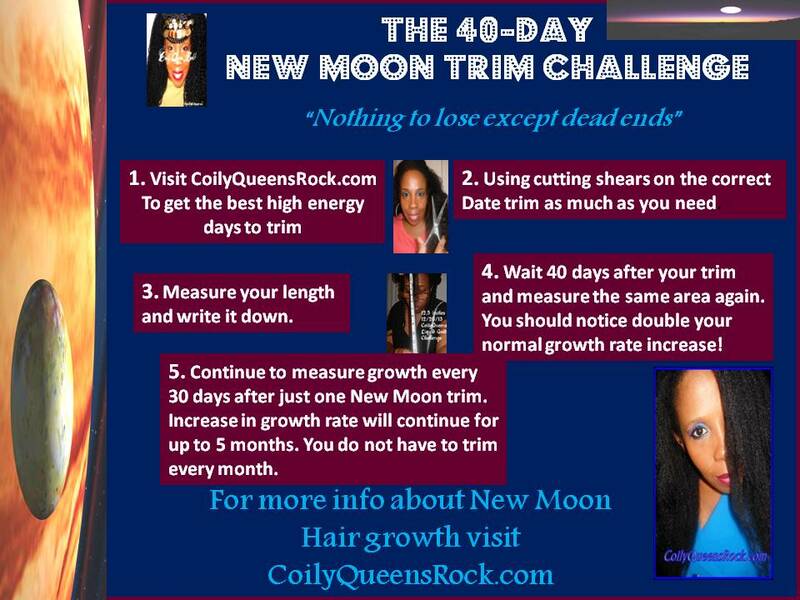 CoilyQueens™ : Come grow with me, take the 40 day New Moon Phase hair growth challenge! Come grow with me, take the 40 day New Moon Phase hair growth challenge! We choose the best high energy days to trim our hair. Then we check out growth in 40 days and see how much we've gained. You may continue to gain over several months from just one New Moon Phase trim. I did a New Moon phase trim last September during a super high energy moon. I cut my very long bangs up to 6 inches. My bangs touched the bottom of my nostril. Today my bangs are almost touching the bottom of my chin. So I gained 3 inches of new growth in 3 months and one week. That is a lot of growth!!! My normal rate is 1/4 an inch per month. This has tripled my normal hair growth rate. WOW!!! I usually get good results from New Moon trimming but not always these types of results. Practicing the CoilyQueens Regimen I trim my hair every 4th month. So it is time for my trim. So of course I will do a New Moon Phase trim, why not! We need to keep our ends trimmed and healthy so why not trim on high energy days and see what happens. You have nothing to lose but frayed ends. So I am inviting you to do a New Moon Phase trim with me. You can watch my hair grow! It will be fun doing this with friends! So come on let's trim and grow together! Got to meet those hair growth goals right! Continue to measure growth every 30 days. 3. Email: Newmoontrimming@gmail.com, put 40 day New Moon challenge in the subject line. I will send you the super energy trim dates. I will share my starting length picture on the "Black Hair Luv" blog, once I do my New Moon Trim. All challenge updates will be on the "Black Hair Luv" blog. I love New Moon trimming and you get to come along with me this time! Okay ladies let's trim and grow together.